Over the past 75 years, there have been numerous advances in prehospital emergency care. The paramedic scope of practice has grown from providing simple first aid to performing highly skilled procedures and interventions. Transport medicine is now used as a method of providing care to patients in the most rural of settings. But we have also seen advances in the science and evidence based medicine for emergency care. The modern concept of CPR was first discovered in the late 1950’s when scientists combined rescue breathing with chest compressions. Back then, surviving an out-of-hospital cardiac arrest was almost unheard-of, and performing CPR and defibrillation was limited to specially trained physicians. But as time progressed, we started to learn more and more about this medical emergency and how to treat it. In the years following the discovery of CPR, much time and energy was directed towards understanding what happens during a cardiac arrest and what we can do about it. Individual groups (such as the American Heart Association or its international counterparts) released advisory statements as to what they thought was the best treatment options, but it wasn’t until the early 1990’s that things really started to change. Scientists and clinicians came together to try and improve outcomes and determine the most beneficial interventions for cardiac arrest patients. The Utstein standard was created as a template for cardiac arrest research, while ILCOR (the International Liaison Committee on Resuscitation) was created to coordinate and advance international science and publicize any novel findings. It wasn’t until 2000 that consensus was reached and the first CPR and ECC guidelines were published and made widely available. With only a few years of scientific research and a couple international meetings, emergency care providers around the world were formally taught the A-B-Cs and the Airway-Breathing-Circulation sequence was coined. These first set of guidelines focused on defibrillation as the one intervention with the best chance of improving survival, and three “stacked” shocks with a compression-to-ventilation ratio of 15:2 became the standard of care. Almost 50 years after the discovery of CPR, the first set of guidelines was implemented worldwide. As time progressed and the body of evidence grew, the CPR guidelines needed to be re-evaluated. In 2005, the literature was reviewed, consensus was reached and the new guidelines were implemented. While the cornerstone of CPR remained the A-B-C sequence, these guidelines saw a change in practice. The compression-to-ventilation ratio changed to 30:2, highlighting the importance of chest compressions while limiting defibrillation to just shock (or analyze sequence) every 2 minutes. But these guidelines also demonstrated something new, they highlighted a trend emerging in prehospital research; evidence based guidelines. Jumping a few years and skipping over an exponential growth in the resuscitation community, a new set of guidelines was released last October. 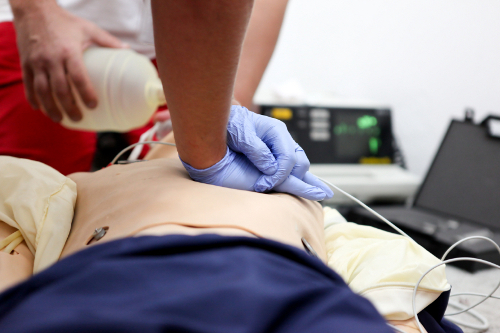 Physicians, scientists, researchers and paramedics alike evaluated years of scientific literature and derived the 2010 CPR and ECC guidelines. These guidelines include 17 parts and cover a broad range of topics from BLS to ALS, from ethics to pregnancies to teaching first aid and everything in between. These guidelines did not just encompass a broad range of scientific evidence, they also suggested many new changes to the current model. The A-B-C sequence was out and a new C-A-B approach was in. While the ratio we have all grown to love (or hate) remained unchanged, the circulation component has dominated these new guidelines, reflecting the growing body of evidence suggesting huge benefits of good quality chest compressions. Also included in these new guidelines was a new simplified form of lay-rescuer CPR aimed at improving the bystander CPR rates. While it has taken us nearly 75 years to get where we are today, there is much that lies ahead in the field of resuscitation research and evidence based medicine. We know that having a bystander simply start CPR and apply an AED can drastically improve survival; we know that certain drugs work better than others. But there is also much that we are still on the fence about or just unsure of. Is C-A-B the right approach? Does 30:2 really work? So come 2015 when the next set of guidelines is to be released, we hope to have the answers to some of these questions and many more. But hey, who knows, with those answers will inevitably come even more questions to be answered in the future. 2 Responses to How did we get to 30:2?